Diana Corvelle and Manu Saluja present a breadth of highly rendered portraiture from twenty three female artists. The work ranges from traditional to contemporary techniques and expresses personal moments of boldness, vulnerability, strength, and humor. At first glance one notices that a majority of the portraits depict youthful, attractive, women. Yet instead of flaunting stereotypical tropes of female beauty, the works possess a substantive investigation of each individual represented. They are intimate windows into the personality of each subject, with some pieces managing to communicate a larger conceptual dialogue beyond the portrait. Bravo to Corvelle and Saluja for curating female artists with voices for those who are Loved and Observed. The success of this work by Julie Elizabeth Brady lies in its utter dissonant foray into the uncanny. 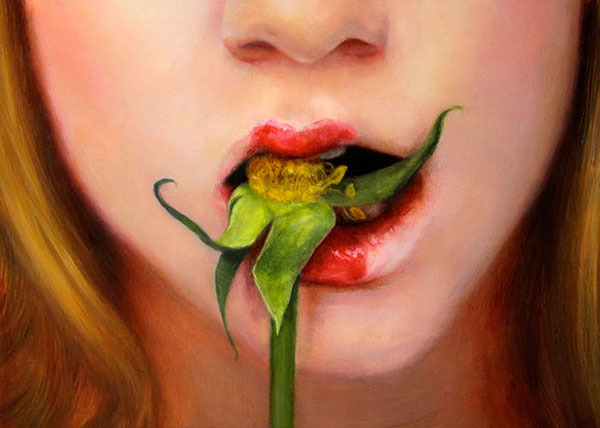 The iconic image of a young woman’s seductively open lips rather obnoxiously permeates pop culture, yet here she offers us a taste of something jarringly unexpected. As she bites a yellow flower-like plant, its leafy tendrils reach across her face like the spindly legs of a giant arachnid. The image is simultaneously playful and aberrant, flirtatious and repulsive, with a hint of the grotesque. It is through this lively use of juxtaposition that the work becomes its own entity, teetering on the edge of ubiquitous pop culture references. It is a conflicting anomaly that implores the viewer to futilely attempt imposing a context or explanation. The more vexing this activity may be, the stronger this work becomes. The intricacies of Diana Corvelle’s piece, “Engagement” transcend the boundaries of portraiture to carry a larger conceptual framework. As a young woman pensively gazes toward the viewer, her identity is strikingly relegated to the masterfully rendered flesh of her face and hands. 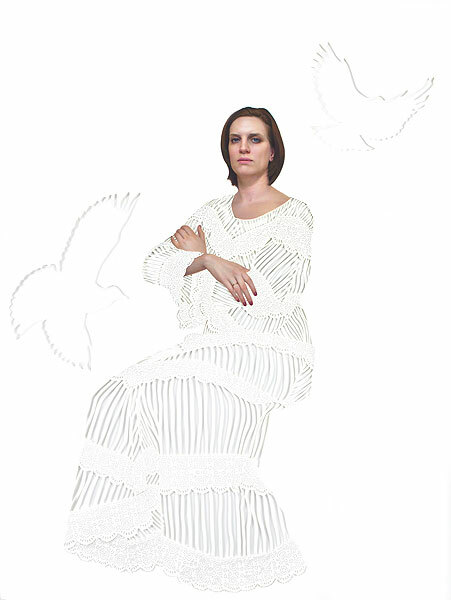 Her body disconcertingly dissolves into the delicately patterned outlines of her dress and the abyssal whiteness of the raw paper. Outlines of two dove-like birds immediately lend a sense of religious symbolism to the significance of the paper’s blistering whiteness. Religious values of innocence, purity, and sacrifice are regularly embodied by the use of white color throughout Christian tradition, and although these antiquated notions are more or less absent in contemporary marriage ceremonies, a white bridal gown still stands as a symbolic vestige of purity. Moreover, the work’s whiteness is encroaching and almost menacing. It engulfs the woman as if she’s immensely pressured by ideals that are threatening to erase her. And what of her engagement? She poignantly positions her hands to mimic the dove’s wings, subtly displaying the ring on her finger. Is she expressing solidarity or a solemn wish for freedom? Diana Corvelle intriguingly activates a dialogue on relationship values, leading one to question or at least consider their own views on the complexities of marriage. Although this diptych by Clarity Haynes is initially refreshing in it’s departure from the idealized female form, it ultimately falls short of its potential. An anonymous woman’s marginalized body is vulnerably and painfully exposed to narrate the ravages of breast cancer. The first image sensitively renders the idiosyncrasies of flesh as identity, yet the second is left lacking the same attention and the artists’s intentionality here is questionable. The second image of the mastectomy portrait is fundamentally the apex of the diptych and carries with it all of the narrative power. Alone it communicates survival, loss, and resolution and could potentially be so impactful that the first image becomes redundant. Wether Haynes was strapped for a deadline or not, she neglected the very essence of this piece. 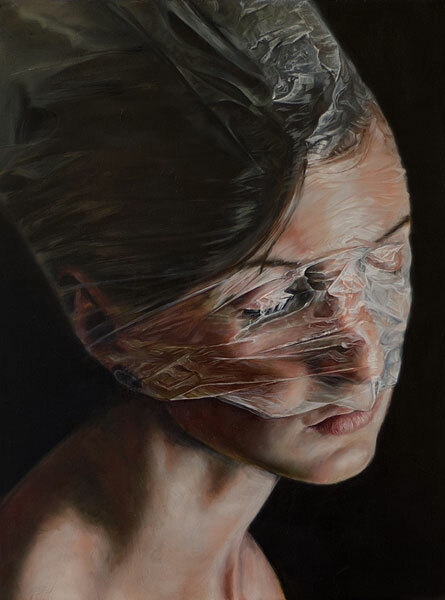 Bordering on hyperrealism, Maria Teicher’s piece “Personal Pinnacle” offers another striking example of a sensitive work with multifaceted connotations. First impressions are immediately ominous as a threatening sheet of transparent plastic constricts around a woman’s face and head. She seems to express resignation, almost serene against the oppressive darkness of a black void. The tension of this piece is fully realized with the symbolic significance of a veiled female face. In every context, (usually religiously motivated), the veil is meant to restrict, conceal, or “preserve” an aspect of a woman’s identity. Wether its completely literal such as the Islamic Burka, or a feature some brides may wear to symbolize their innocence in Christian tradition, the control and ultimate negation of the female form is paramount. What makes this work even more disturbing is the fact that this veil is made of plastic, a dangerous and suffocating material that the woman seems to accept. Was it forced upon her or did she acknowledge it herself? Teicher opens a feminist dialogue with this delicately painted work that possesses a powerful, bold, and important voice. Artists: Elizabeth Adams­‐Jones, Erin Anderson, Juliette Aristides, Julie Elizabeth Brady, Aleah Chapin, Diana Corvelle, Michelle Doll, Alia El Bermani, Alexandra Evans, Shauna Finn, Nanette Fluhr, Nanci France Vaz, Kristy Gordon, Clarity Haynes, Leah Lopez, Gaetanne Lavoie, Lauren Amalia Redding, Kay Ruane, Manu Saluja, Holly Ann Scoggins, Rabecca Signoriello, Emily Slapin, Maria Teicher. July 15, 2014 in Art Review.